a piece of metal, cast or struck, often coin-shaped. The obverse and reverse bear bas-relief and inscription. Commemorative medals are issued in memory of a notable person or event. in botany, common name for members of the Labiatae, a large family of chiefly annual or perennial herbs. Several species are shrubby or climbing forms or, rarely, small trees. Members of the family are found throughout the world, but the chief center of distribution is the Mediterranean region, where these plants form a dominant part of the vegetation. The Labiatae typically have square stems, paired opposite leaves, and tubular flowers with two lips, the upper divided into two lobes and the lower into three. The leaves sometimes grow in whorls; the flowers may be white or shades of red, blue, or purple. common name for any plant of the genus Lavandula, herbs or shrubby plants of the family Labiatae (mint family), most of which are native to the Mediterranean region but naturalized elsewhere. The true lavender (L.
[ultimately from Lat.,=dew of the sea], widely cultivated evergreen and shrubby perennial (Rosmarinus officinalis) of the family Labiatae (mint family), fairly hardy and native to the Mediterranean region. It has small light-blue flowers. , fragrant shrubby East Indian plant (Pogostemon cablin or P. patchouli) of the family Labiatae (mint family). It is the source of a perfume oil, also called patchouli, distilled from the leaves. , any plant of the genus Ocimum, tender herbs or small shrubs of the family Labiatae (mint family), mostly of Old World warm regions and cultivated for the aromatic leaves. The basil of Keats's "Isabella" (and of Boccaccio's story) is the common or sweet basil (O.
, any species of the genus Thymus, aromatic herbs or shrubby plants of the family Labiatae (mint family). The common thyme, which is used as a seasoning herb and yields a medicinal essential oil containing thymol, is the Old World T.
name for any plant of the genus Satureja, aromatic herbs and subshrubs of the family Labiatae (mint family). Commonly cultivated as border ornamentals or potherbs are two species of the Mediterranean region and surrounding areas: summer savory (S.
, Old World perennial aromatic herb (Marjorana hortensis) of the family Labiatae (mint family), cultivated in gardens for flavoring. The tops yield origanum oil, once used medicinally but more recently for perfuming soaps. , name for several herbs used for flavoring food. A plant of the family Labiatae (mint family), Origanum vulgare, also called Spanish thyme and wild marjoram, is the usual source for the spice sold as oregano in the Mediterranean countries and in the United States. strong-scented perennial herb (Nepeta cataria) of the family Labiatae (mint family), native to Europe and Asia but naturalized in the United States. 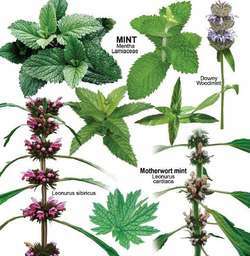 name for two similar plants of the family Labiatae (mint family), usually distinguished as true, or European, pennyroyal (Mentha pulegium) and American, or mock, pennyroyal (Hedeoma pulegioides). , aromatic, perennial, somewhat woody herb (Hyssopus officinalis) of the family Labiatae (mint family), native to the Old World but partially naturalized in North America. The plant has small, violet-blue or sometimes pink or white flowers. aromatic Old World perennial herb (Marrubium vulgare) of the family Labiatae (mint family), naturalized in North America. It has woolly white foliage and tiny white clustered flowers and is called the common, or white, horehound. , trailing evergreen perennial (Micromeria chamissonis) of the family Labiatae (mint family). It is native to W North America and especially common to woodland areas along the Pacific coast. ..... Click the link for more information. have been similarly used. Species of the Labiatae are often grown as ornamentals as well as in herb gardens, and in the United States several have escaped cultivation and become naturalized as wildflowers. Types of hyssop, sage, pennyroyal, mint, and lavender are among the prevalent native species. white crystalline substance with a characteristic pungent odor. It is derived from the oil of the peppermint plant, Mentha piperita (see mint), or prepared synthetically from coal tar. An alcohol, menthol is freely soluble in ethyl alcohol, ether, and chloroform. ..... Click the link for more information. (obtained also from other mints), and for flavoring purposes, especially in chewing gum and candy and as a disguise for disagreeable tastes of drugs. Spearmint (M. spicata) is distinguishable from peppermint by the absence of a leafstalk. Its flavor is milder (the aromatic principle is carvone), and it too is used in chewing gum and medicines and is often cultivated in gardens as a flavoring. Both plants are European perennials now naturalized in the United States. The mint family has over 7,000 species! And they are all edible. They become pretty easy to recognize after a while. Square stems, tiny hairs on stem, vertically stacked crunched flower bundles usually light purple, white or pink on top of stem or in several clusters along the vertical stem, usually where leaves are. Used for colds, flu, fever, indigestion, gas, headache, diarrhea, colic, sore throats, stomach aches. Whole plant is edible. Mint has strong oils. It is advisable not to take while pregnant. Important- make sure the plant looks and smells like mint. Some plants look like mint but don’t smell like it, or smell like mint but don’t look like mint- stay away! MINT Downy Woodmint (Blephilia ciliata) Soft fur on underside of leaves. Whitish blue purple flowers. Tea used for indigestion, colic, coughs, colds, chills and fevers. Make warm poultice with leaves for sinus headache. Chewing fresh leaves kills bacteria in the mouth and is good for teeth and gums. a state enterprise which mints coins and manufactures orders, medals, and other state insignia of distinction made of metal, as well as various minted and stamped articles made of metal using gold and silver plating and jeweler’s enamel. Mints originate with the formation of national states, when the minting of coins becomes a state monopoly. The first mint in Russia appeared in Moscow in 1534. In 1724 the mint in St. Petersburg was established and in 1876 became the only one in the country. In England a mint was established in London in the late 12th century, while in the United States the first mint was organized in Philadelphia in 1792. In the first years after the Great October Socialist Revolution coins were not minted. The mint in Leningrad (formerly Petrograd) produced orders and anniversary medals until 1921. In August 1921 it began to mint silver coins, and in 1924 copper coins, followed later by bronze and nickel coins. In 1961 brass and nickel silver coins were first minted there. The Leningrad mint produces coins for circulation on a 1961 design. The mint in Moscow, which was set up in 1942, makes orders and medals of the USSR, insignia of distinction, and other articles from precious metals. Hand-made gourmet products from Boston-based Toscanini's will be served on all Mint flights departing from Boston. Offering free parking, free admission and free scheduled public tours, the Mint is a must-see attraction on any Canberra itinerary. Mint Indian Bistro in Las Vegas, Nevada, is a full-service Indian restaurant with a truly contemporary twist in its food, its decor, and its approach. Most mints are reproduced vegetatively, by division, root or stem cuttings, and few garden-worthy mints come true from seed. In South Africa -- the world's second-largest gold producer -- Natanya van Niekerk, deputy general manager for numismatics at the South African Mint Company, said she had seen a big increase in demand for gold. The new Optamint product line includes mint enhancers, building blocks, top notes, and signature mint profiles. They have already proved successful in the Australian market where they are sold under the Eclipse brand and are now the top-selling mint. The mint industry is bustling with an array of flavors like: Black Licorice, Green Tea, Chocolate, Peppermint and Cinnamon just to name a few. Why does the Mint think this series will be popular? Mint has issued a new "interim" rule making the melting of pennies or nickels punishable by up to five years in jail and up to a $10,000 fine.